This is intended as a fairly simple guide to making and posting a podcast. For more detail, please see Apple's Podcasting Help Pages (for links to some individual sections see below). Firstly, you need to record your first podcast episode in an audio editor, and save it as an .mp3, .m4a, .m4v, .mov or .mp4 file (not Windows Media, RealMedia, Flash or YouTube). The link you will put in the feed must be directly to the media file, not to an embedded player of the sort provided by various file-sharing services (including YouTube videos which won't work). Don't include any spaces or accented characters in the name - stick to plain letters and numbers, and - or _. Upload this to your webspace and note the URL by which it can be accessed. (The company who provides your internet connection may offer webspace, or there are plenty of other companies who do.) Apple now recommend that the server should use a secure connection (https rather than http), however using https will cause some podcast creation programs to fail to create the necessary 'enclosure' tag. It appears that if you do use https for your media files (and you should use one or the other for all of them, not mix the two) you must also use it for your images. There are various media hosting sites which provide their own displays of the media: these can work but it's necessary to be able to provide a direct URL to the file and some don't allow this. Some, such as SoundCloud, force a download by default and this must be disabled. Storage sites such as Dropbox and Amazon can be problematic; and Google Drive is best avoided altogether as it has caused endless problems. In many cases the bandwidth is limited, so if your podcast becomes popular they will be unable to handle all the requests. These sites are mostly designed to store your files, and perhaps share to a limited number of people, not serve them to a large audience. Apple have posted a useful list of suitable podcast creation and hosting services. Some people intermix episodes with and without playable media to match the way their weblog is constructed; this can cause problems. In any case iTunes does not display episodes with no media. You should also note that if when you submit your feed the top episode is one without playable media the Store will reject the submission as it checks only the top episode and won't notice the others which have media. To complicate matters, Apple now require the server you host your media files on to have 'byte-range support' enabled - basically this means coping with requests for only part of a file at a time, which is required for the iPhone to be able to play podcasts - and refusing to accept podcasts where this is not the case. You should confirm with any proposed hosting service that they support this: if they don't (or don't know what it is) you should find another hosting service. Now you need to write the 'feed' file which tells iTunes and other services about your podcast. There are programs which can do all this for you and make the process a lot simpler: one such, for Macs, is Feeder; iWeb (now discontinued) and RapidWeaver can also do this; I don't know about Windows but there must be similar programs. There are also online services such as Blogger, Podbean or LibSyn which will handle a lot of the work for you but will also leave you with less control. Many people use Wordpress, which is powerful but has a steep learning curve - you may find this instructional page helpful. Personally I wouldn't mess about writing my own XML file, but if you are going to write the file yourself: copy the sample XML file below and paste it into a plain text text editor. Amend the sections in red (of course they'll probably be black in the text editor) with suitable information. Note that there must be no line breaks between the < and > tags (the browser display may have put some in). Note that if checking in FeedValidator, 'itunes:order', 'itunes:isClosedCaptioned' and 'itunes:complete' are recently added tags and as it does not recognize them it will flag them as errors, which you can ignore. For an explanation of how the various tags appear in iTunes please see this page. Some additional tags have been added for the Podcasts App on iOS11 - it's not clear whether they will work elsewhere. They are listed here (PDF). Apple provide a list of suitable categories here and it's best to stick to them. The URL for the media file given in the 'enclosure' tag must be a direct link to the file, not using a script to force a download, and scripts redirecting to the actual file may not work - this includes URL shorteners such as tinyurl. Also, your episodes cannot be password-protected (and you cannot charge for your podcast). A caveat: if you are hand-writing the feed you cannot use the '&' character directly, e.g. 'Apples & Pears'; you must use the html code for it: 'Apples &amp; Pears'. A loose '&' in your feed will cause it to be unreadable (since its presence indicates the start of a code which you are not supplying or concluding). You should also avoid 'curly quotes' (this often arises when people compose in a word processor and then copy in) as these will wreck the feed - as will emojis. The 'Podcast image' which appears on the iTunes Store page (see the illustration above) is referenced in the 'itunes:image' tag; it needs to be .jpg or .png, minimum 1400 x 1400 px and maximum 3000 x 3000 px, and it's advisable that it should be less than 500kB. Some people have found that it can take several days to show after the podcast first appears, or if you change it it can also take several days before the change comes into effect. (If you decide to change it you must also change the filename.) 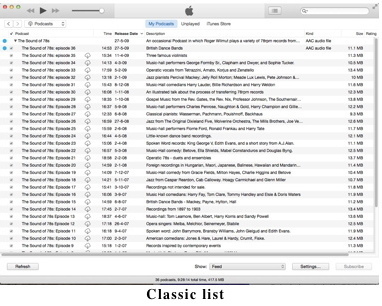 Note that when people subscribe to a podcast they do not see this image in older versions of iTunes: the explanation for that is here. If you have individual episode images in the feed these will not show in the Store; if you have embedded images these will show when subscribing in iTunes but not in the iOS Podcasts app. Save the feed as a plain text file with the name rss.xml or podcast.xml - or any name but the extension must be .xml (and not .txt). You would be advised to make everything in the URL lower-case as apparently the iTunes Store has taken on occasion to failing to recognize URLs with capital letters in. Upload the feed to your webspace. When you come to add further episodes, duplicate the <item>...<item> section and place it above the present <item> section (so you get latest items on top - unless you want them on the bottom of the list). Enter the data for the new episode (note that the 'guid' tag must be different from other episodes, usually put the URL in again), save and upload. 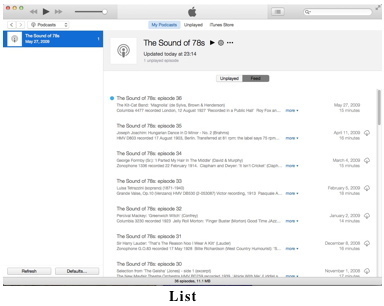 To test your feed: open iTunes: from the 'Advanced' menu choose 'Subscribe to Podcast'. Enter the URL of the feed file (not the audio file) and hit return. If the feed works your podcast and episode(s) will appear in iTunes and you can check if it plays. If so you are ready to submit it. (You can delete it from iTunes at this point). If it doesn't work, go to http://www.feedvalidator.org/ and enter the feed URL - this will show any errors. (It may throw up a few insignificant ones). You can also check your feed at http://castfeedvalidator.com. There is more detailed information on diagnosing a podcast feed on this page. Although this is a technical help page, it may be worth adding a warning about copyright. Many podcasts consist of 'mixes' of commercially issued recordings taken from CDs or downloads. Using such material without proper clearance (which you are unlikely to get) is a breach of copyright - the fact that you are not charging for your podcast is irrelevant, and buying a CD gets you the right to listen to it privately, not to broadcast it. If the Store staff spot that you are doing this they will remove your podcast; and though many people do it and get away with it because no-one notices, at least one podcast creator has received a demand for $25,000 plus legal costs and claims for loss; I doubt he has any defence against this. So it's something you may want to at least bear in mind when planning your podcast. There is a range of 'podcast safe' music available which allows you to use it in a podcast: Google 'podcast safe music' for a number of sites offering this. If all is well, you can submit your podcast. Go to https://podcastsconnect.apple.com and log in with the ID you use for iTunes. Click the blue '+' sign at top left and enter the feed URL (not the URL of the media file). Click 'Validate' and the page will check for errors. If it passes, and you are happy with the preview you should see, click 'Submit'. iTunes does not store your media, it just uses the contents of the feed file to provide the details and access on the iTunes Store. (None of this will cost you anything). (Some people have found that having logged in they aren't taken back to the Podcasts Connect page. In this case you should a) make sure your Apple ID has a credit card associated with it; b) you've activated the ID and accepted the Terms and Conditions; c) you've logged in in the iTunes Store; and d) if you're on a computer, it's been authorised - in the iTunes Store, menu Account>Authorisations>Authorise this computer). It may take some days before the podcast is accepted, since each new podcast has to be checked. You may be rejected for unauthorized use of copyright material, bad language and sexual content, libel, or racist comments (see the list here) - but of course you would never do any of those things, so you should be OK. If you click on your podcast on that page you will open an info page which gives you your feed URL and also a 'mirror URL' which redirects to your feed (even should you go through the process of changing its URL, see below). There is also a link to your iTunes Store page. The links there also include the ability to hide your podcast from the iTunes Store: there have been reports of this being invoked by accident, including with new podcasts, so if your podcast isn't appearing in the Store that is the first place to look - click the 'Unhide Podcast' link (in the position where 'Hide Podcast' is in the picture). If you don't know your iTunes Store page URL you can also find it by searching on the name of your podcast and bringing up its page in the store, then control-clicking (Mac) or right-clicking (Windows) on the podcast image (or where it should be) and choosing 'Copy Link'. You will also eventually be able to search on your podcast's title, though this can take some time to become available. However searching just on the category in the iTunes Store is most unlikely to throw up your podcast. There are thousands of podcasts out there, and it would be quite impossible to display on one page the entire list for any category. What you see are 'featured' podcasts, chosen by Apple as being special; please see this Tech Note: note that there is no way you can influence the selection other than making your podcast really special (bribery won't work). When you want to add an episode, upload it and amend and reupload the feed file as described above (new episodes above the old ones). It usually takes 1-2 days for the new episode to appear, though subscribers see the changes pretty well immediately (since they are accessing the feed directly, not through the Store). Regrettably the iTunes Store provides no way of monitoring the entire number of people who visit your podcast; their Help page here looks at ways of interpreting the logs on your server. iOS 11 and above provide anonymized statistics on episodes played (and whether wholly or partially), however this will only apply to Podcasts listened to on the iOS11+ Podcasts App, not other readers (including iTunes on a computer). As there have been some relatively recent, and rather confusing, changes in the way iTunes handles the display of podcasts it may be worth noting them. By default only the most recent episode shows when you first subscribe. To show all episodes click 'Feed' at the bottom of List view. Two different ways of displaying subscribed podcasts can be accessed from menu 'View' >' View as' > 'List' or 'Classic list'. In both views you can delete downloaded episodes by control- or right-clicking on the name of the episode, by clicking on the three-dots icon to the right of the title which appears when you hover over it, or by highlighting the episode and hitting the delete (backspace) key. The first two of these actions also bring up additional options. Each episode can be double-clicked to be played as a stream without downloading it first (so you don't have to wait for it to download fully). Click the cloud icon at right to download it (as you will have to to sync it to an iPod). 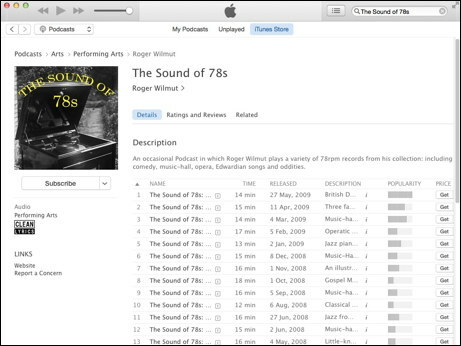 There may be further changes in the revamped iTunes 12.7. If your podcast is rejected on its initial submission, or removed once it's appeared in the Store, this can be for a variety of reasons - see the list in this Apple Help page. What you do about it depends on the reason for rejection. Obviously you must first locate and deal with the problem. In some cases, such as difficulty accessing the feed or media files, being in the wrong category, etc., you can go to Podcasts Connect and resubmit your feed. However some reasons for rejection will mean you cannot resubmit the podcast and it will be dimmed out in the dashboard at Podcasts Connect. In this case you will either have to contact Support and request reactivation, or change the feed URL and the podcast title and resubmit it as a new feed (which will lose any rankings, reviews, etc.). To contact Support go to https://itunespartner.apple.com/en/podcasts/overview and click the 'Contact Us' link at the bottom of the page. If you want to move your feed to a different URL there are three methods. The best way, assuming you have access to the original feed, is to add the following tag to the top section of the feed, between the 'channel' tag and the first 'item' tag. Subscribers using iTunes will normally pick this up quite quickly but you should leave it there for at least 2 weeks - when subscribers next check, their iTunes application will transfer its attention to the new feed. You may also wish to use a 301 redirect if you have access to the server (see below). Be very careful when typing in the new URL because if you make an error and redirect iTunes to a non-existent URL you will not be able to retrieve the situation and subscribers will lose contact with your feed unless they go back to the Store and re-subscribe. You should note that this redirection is permanent once effected: removing the tag from the old feed has no effect. However in cases where you don't have access to the original feed you can go to https://podcastsconnect.apple.com (sign in if necessary) and click on your podcast. 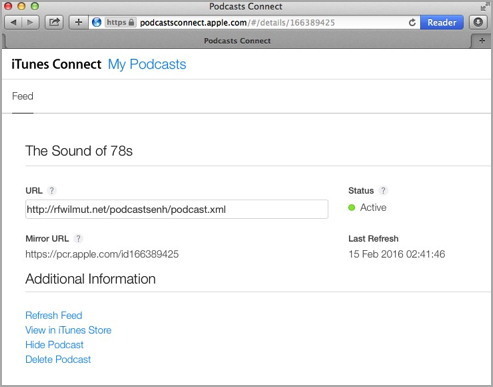 This will bring up an info page with a field containing the current URL of your podcast. Replace this with the new URL and click 'Save'. Then click 'Update' and the page will check that your feed is valid. If there are any errors you should correct them, then click 'Save' and 'Update' again. This will change the Store to using the new feed, but again it will take 1-2 days to do so. Note that doing this does not change anything for your subscribers (since their iTunes applications read the feed directly). To confirm what iTunes is up to, click 'Subscribe Free' in the Store page for your podcast. Go to the Podcasts section in the sidebar: you should see your podcast listed in the main pane. Control-click (Mac) or right-click (Windows) the line for the entire podcast (not an episode) and choose 'Copy Podcast URL'. When you paste into a text program you will see which feed iTunes is working from. Let's call the original feed URL 'A' and the new feed URL 'B'. A 301 redirect on the server causes all requests for A to be redirected to B, whether they come from iTunes, web browsers or other RSS clients. Most browsers will remember this redirect even if it is removed from the server, at least until their cache expires at which point they may revert to trying to access A. 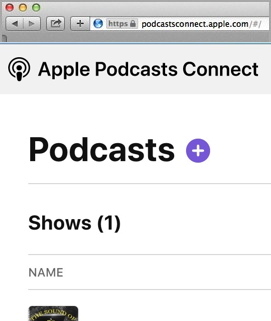 When you add the 'itunes:new-feed-url' tag to feed A, the iTunes Store, iTunes application and (I assume) the podcasts app are permanently redirected to B. Once they have accessed A and seen the tag they will always access B in future for that podcast. This tag has no effect at all on browsers or on any other RSS client. Therefore if your subscribers and visitors are only using iTunes, then all you need to do is to add that tag to A. You can remove the old feed after a couple of weeks as by then all subscribers will have had a chance to check the feed and be redirected. The Store will redirect when it next checks the feed, usually within a couple of days. However if anyone is using some other RSS reader the 301 tag is essential to keep them up to date. If you enable one, then obviously iTunes will be redirected to B and will not see the redirection tag. However it's possible that as soon as you remove the tag iTunes will revert to looking for A. As already said, the really important caveat is to make absolutely sure you have the redirect correct. If you implement the 'itunes:new-feed-url' tag but get the URL wrong, you can't undo it - anyone seeing the tag will be redirected to a non-functioning URL and you have no way of getting them back.